Zucchini is one of the most rewarding vegetables to grow. It looks gorgeously ornamental on a vegetable or even flower bed and reliably productive. Even when I was living in a city house with a tiny backyard, each season I grew one zucchini plant there, as I had space only for one. But, you really doesn’t need more! One plant provides you with plenty of crispy fruits for eating and preserving, not to mention lots of moist and flavourful Zucchini Breads. In a large bowl mix eggs with sugar and add all wet ingredients: grated zucchini, grated carrot, ghee or melted butter, vanilla extract. Stir well. In another bowl combine all the dry ingredients: flour, cinnamon, nutmeg OR cardamom, baking soda, baking powder, salt. Mix well. Add dry ingredients to eggs and vegetables mixture, add nuts. Mix well. This would make enough batter to make 2 loafs. Divide it into 2 well greased 5″x 9″ loaf pans and bake at 350F oven for 60 (sometimes it takes even 70) min or until a tester stick comes out clean. Cool loafs in pans for 10 min or so, then carefully take them out and let cool completely. I like to make this bread from dark green Italian zucchinis and never remove the skin, though many prefer to do it. 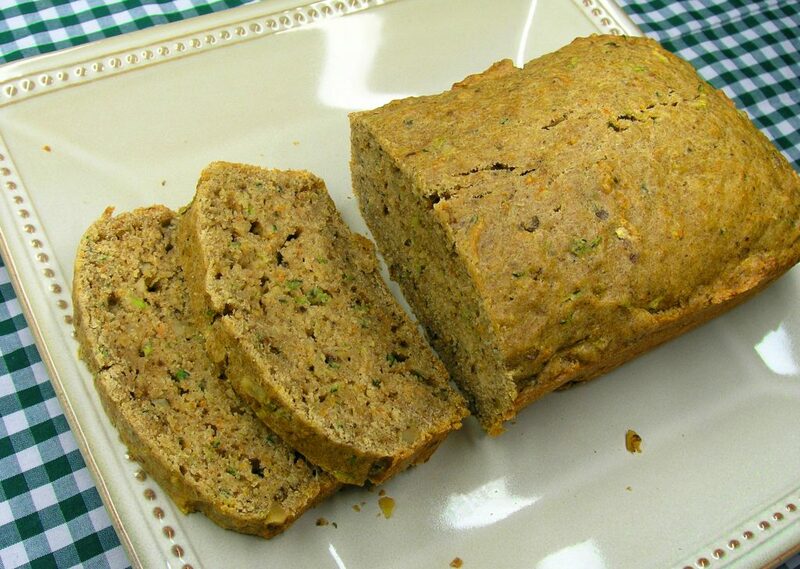 Together with carrot, dark green pieces of zucchini skin create bright and happy speckles in the bread! Enjoy!